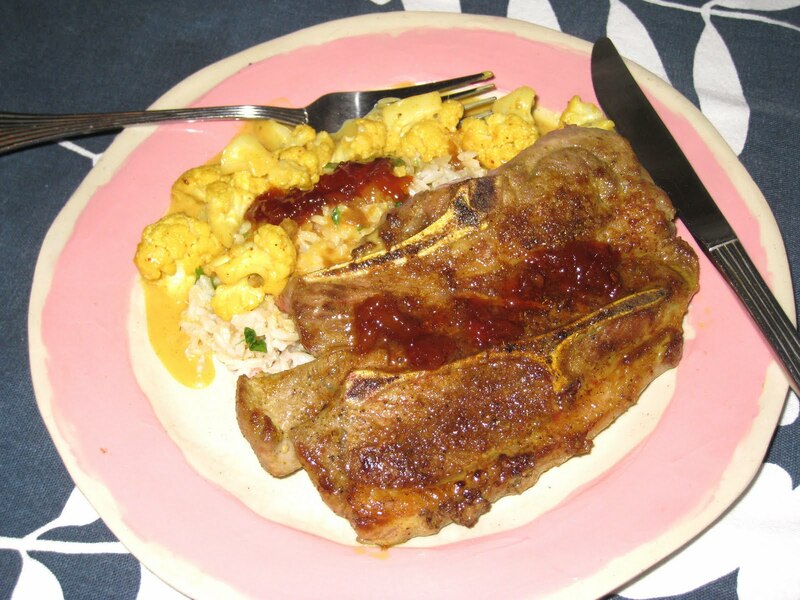 If I had to pick a favorite cut and type of meat, it would have to be lamb shoulder chops. I know they are tougher and have more fat and gristle than their loftier cousin, the loin chop, but they have so much more flavor. It is most likely because the shoulder chop was the only lamb we had when I was growing up. And it was a rare treat. My father took charge of the broiler when we had meat, and he liked his meat on the rare side, so the chops were always cooked perfectly medium-well, which is how I liked my meat back then. A little mint jelly on the side was the path to pure heaven. 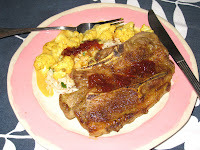 After I left home, I still considered lamb chops as something special, something for a special occasion. The mint jelly morphed into dried mint sprinkled along with the salt, pepper and garlic powder before broiling. Why mess with a good thing? As with flank steak, I just couldn't imagine there could be a better flavor profile out there than the one which I had always used. Until I ran across a recipe for lamb chops that involved cauliflower and curry powder. I like cauliflower, but I don't love it. I downright hated it as a child, and never really cooked with it, but I have liked it in restaurants so I always have an eye out for recipes that call for it. When I saw how easy the recipe looked I decided to give it a try. And it was delicious. The curry powder punched up the flavor without interrupting the intense lamb taste that I love so much in the shoulder chops. 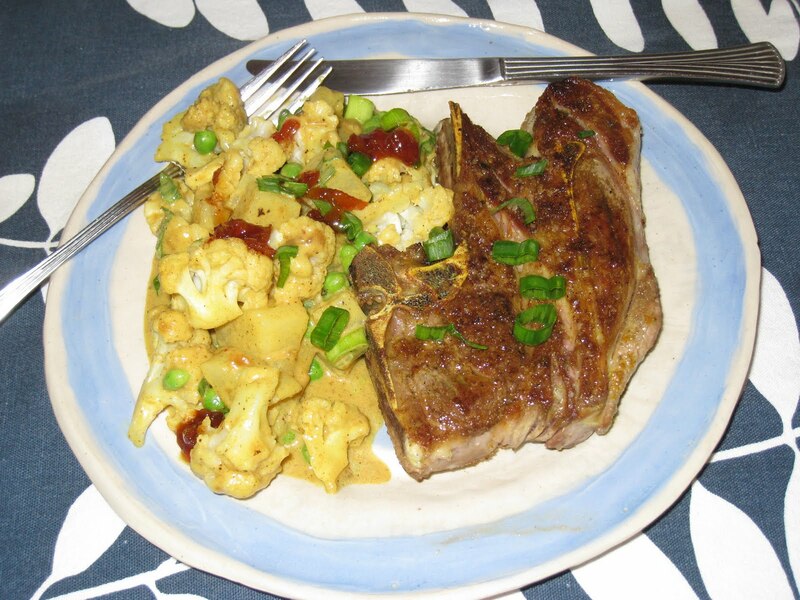 The cauliflower was delicious in the curried sauce, and the mango chutney added a sweet heat that rounded out the overall effect. I thought it needed some starch, though, so I cooked up a batch of cilantro rice that was the perfect accompaniment. I also forgot the green onions, but I did not miss them. They would have been good, but they were not a make-or-break ingredient. As good as it was, though, I thought I could make it better. I liked it enough to make it again the next week, and I decided to add potatoes and peas to the cauliflower for more of a vegetable curry. It was quite delicious. I don't know when my lamb chops will be seeing mint again. This is just as good with just the cauliflower, or with the added potatoes and peas. If you decide to make it with just the cauliflower, then steam the cauliflower for about 4 minutes and use 1/4 cup each of the chicken stock and the cream. Steam potatoes until just starting to get tender, about 5 minutes. Add cauliflower and steam for another 4 minutes, until the potatoes are tender and the cauliflower is tender, but still crisp. Transfer to a colander and sprinkle with salt and pepper. add the salt, pepper and curry powder to the other side of the chops. Cook the lamb to the preferred doneness, about 5 minutes per side for medium rare. Transfer the chops to a plate and cover with foil. cream. Add the mango chutney and cook until the mixture is thick, about 3 minutes, whisking constantly. Add the vegetables and half of the green onion, allow to heat through. Serve the vegetables with the lamb chops. I’m an intern with Superior Farms and I noticed your great article on your preparation of lamb! Since you were reminiscing about the past and present lamb preparations, I thought you might be interested in our summer grilling promotion at www.GrillLamb.com. We’re giving away a Mediterranean cruise for two and promoting simple Mediterranean seasonings for lamb. We are hoping to get more lamb lovers this summer by highlighting delicious recipes and cooking tips. If you have any posts coming up, we would love to hear about them! Also, look for us on Facebook.